4. Enter our server IP address: 54.149.58.176 for the '@' record entry. Select the Delete checkbox next to the 'www' entry, and click Continue. On the next page, click Save Changes to confirm the change. You will be returned to the DNS records overview page. 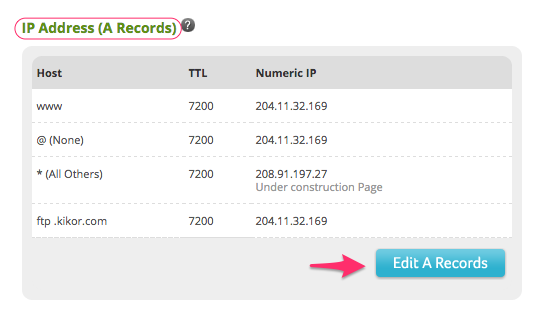 Note: It is normal to still see the www A-record entry even if you deleted it. Network Solutions will continue to display this entry, even if no IP address entry is set for it. The www entry will display a destination of "none". This is normal. 4a. (Optional) If you are using Google Apps or another service for your email, you can now edit your MX records for that service. Here are the Google Apps records. 5. Next, click the "Edit CNAME Records" button. Now you will create a new www CNAME record to point to 'sites.clickbooq.com' (double-check the spelling! that is a 'Q' at the end!). Enter www into the Alias field, enter 3600 into the TTL field, check the Other Host checkbox and enter sites.clickbooq.com. Click Continue, and Save Changes on the resulting page. Note: You may see an error when trying to add the www CNAME record. Network Solutions is sometimes a little slow to update your previous action. Wait a few minutes and try to save your changes again. 6. Please allow 2-3 few hours for your new DNS changes to update. Once DNS server caches have updated globally, your custom domain will resolve to our servers.